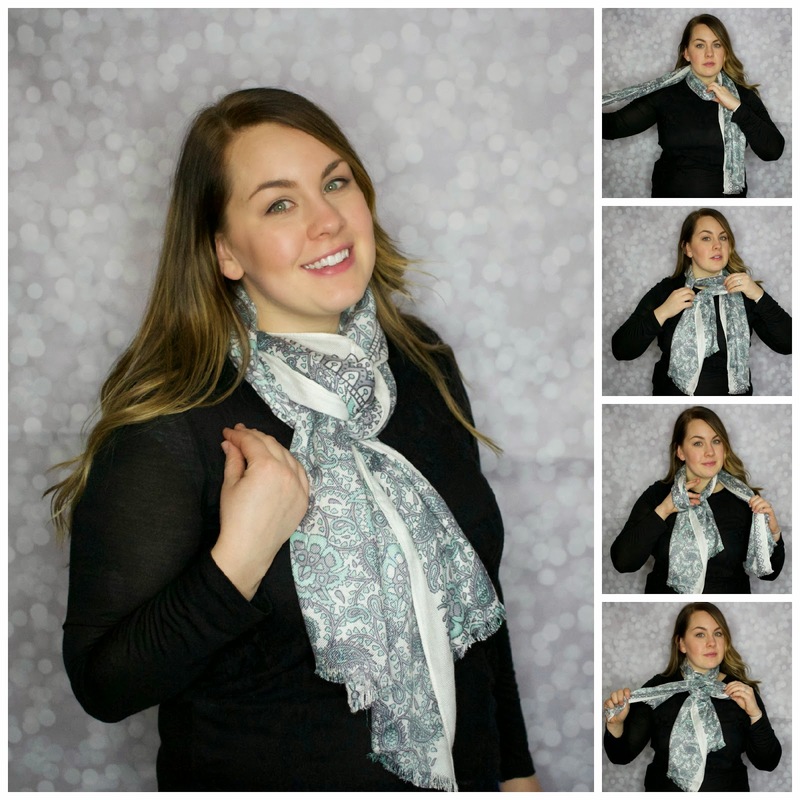 Today I’m really excited to share with you some amazing scarves from Pashmina Perfection ! These scarves are 1. BEAUTIFUL 2. super soft and 3. SUPER versatile! I’m literally in love with them! Some people might think that scarves are only for the snow and sleet, but I love to rock scarves in the spring and summer as well! As long as they aren’t chunky knit scarves that is! When I first started wearing scarves in college, I never new how to tie them. Since then, I’ve loved learning the art of tying scarves and today I’d like to teach you how to tie a scarf yourself! There are SO many ways to wear scarves…sometimes it’s hard to choose! 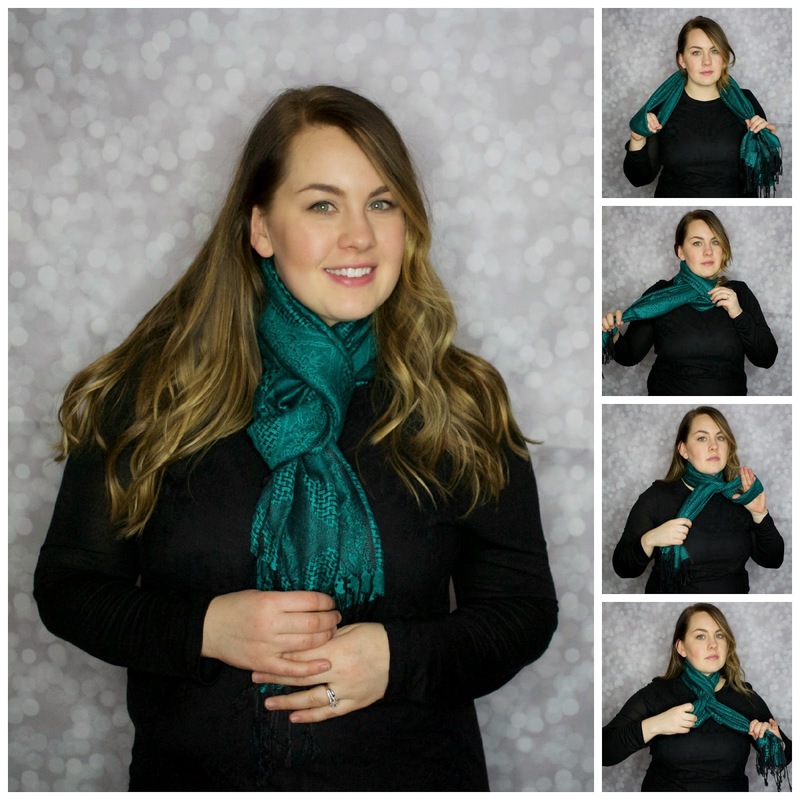 Today I want to show you all my favorite ways to wear scarves and how easy they are! I hope this post is helpful when styling your future outfits! Loop the scarf around your neck once. Take one side of the scarf, and pull it upwards through the first larger loop. Stop about half way to create a littler loop. Take the other end of the scarf and pull it all the way through the littler loop. Fluff out the scarf and you’re done! Split the scarf in half and wrap it around your neck. Pull both loose ends through the first loop and pull tight. With the loop still in hand, twist it 180 degrees to create a separate loop. Feed the loose ends through this loop. 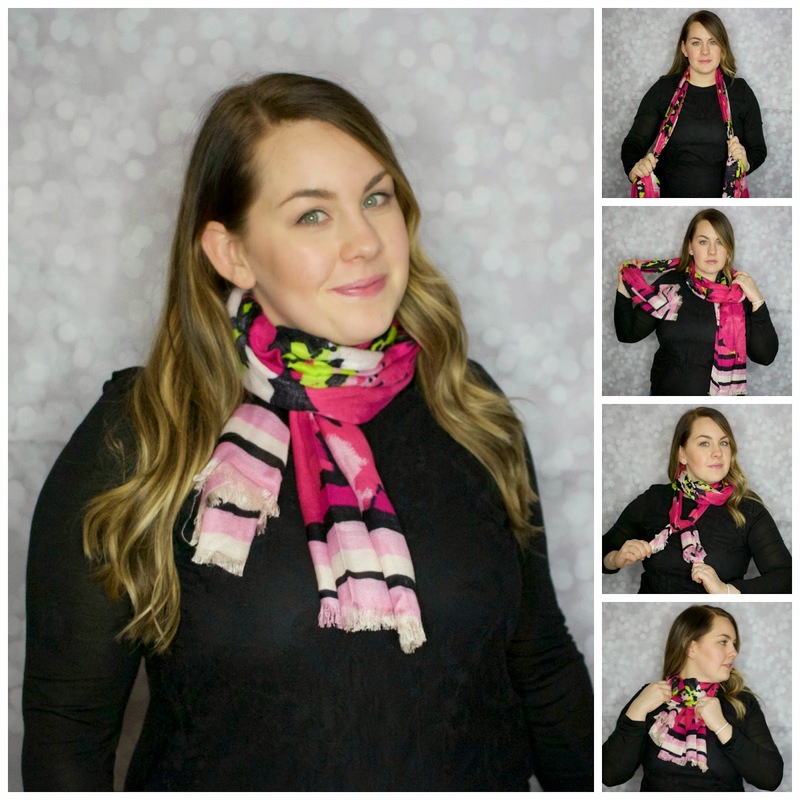 Fluff out your scarf, and you’re done! This is pretty self-explanatory, but it’s so chic, I HAD to include it! All you do is place the scarf around your shoulders and let it hang. You can either wear it draped down your back, or tight in the front, the choice is yours! This way is probably my favorite! First, wrap the scarf around your neck once. Take the two loose ends and tie them in one knot. Tighten this knot and place the knot underneath the loop that is around your neck. Fluff out the loop and the ends, and you’re done! Pashmina Perfection was kind enough to offer to giveaway a free scarf/wrap to TWO lucky Dressing Dallas readers! How cool is that?! All you have to do is enter below! And remember, the more entries you complete, the more chances you have to win!! I love the "Tea on the Terrace" scarf. So pretty and perfect for Spring! Torn between Bahamas Bound (I know my mom would love it) & Summer by the Sea! Love how you tied these scarves! I am going to try that last one as soon as possible. My favorite scarf is Pleased to Meet You — perfect for spring! I can't decide! I like either the It's a Marshmallow World one or the Vacationer best. I love the "Vacation in Venice" scarf! These are GORGEOUS! I'm loving the Touring The Vineyard Pashmina. The Morning Fog Scarf is my favorite. Love the pattern and colors on this one. 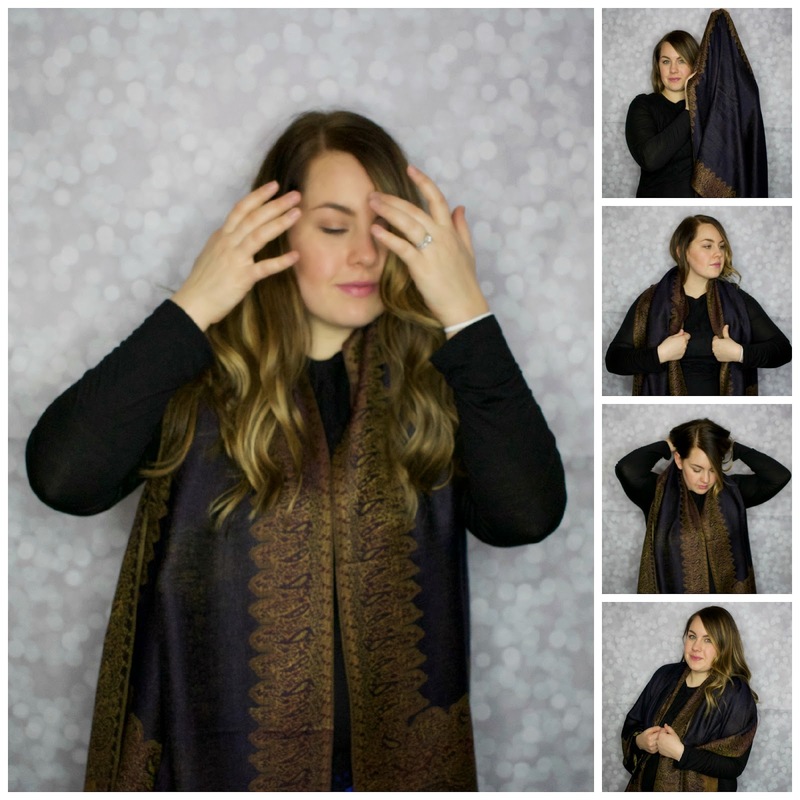 I love the midnight navy pashmina! I love the top of the morning scarf! I love the Dance With Me Pashmina. It's perfect!! Thanks for entering! Yes!!! That one is one of my favorites too! That one is so cute! Thanks for entering! That one is an awesome choice! It's hard to decide haha! Thanks for entering girl! good luck! That one is fabulous! Good luck!